A storage system, packaged with a GameCube Memory Card, that allows you to store Pokémon caught in Pokémon Ruby & Sapphire. You can store up to 1500 Pokémon in the boxes, and arrange them, sort them into categories and search for them as you need them. You can also display your Pokémon in a Showcase and play Ruby & Sapphire on the TV screen using the GameCube-GBA Link Cable. In Europe, Pokémon Box was only available as a promotional item or as part of the Pokémon Colosseum Mega Pak bundle. 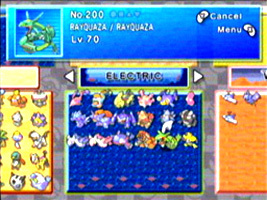 In the United States the game was only available through the Pokémon online store and Pokémon Center store in New York.